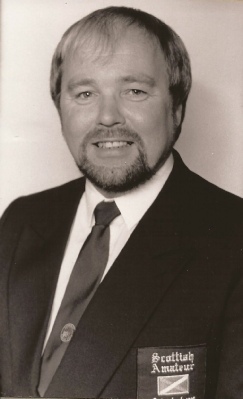 Andy Murdoch President of SASF formed in the early 80’s by himself and his senior Black Belts to promote karate further in his area and nationally. 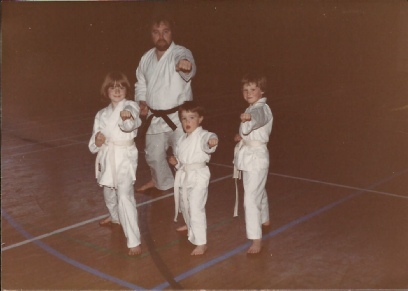 The start of the Murdoch family taking up Shotokan Karate. 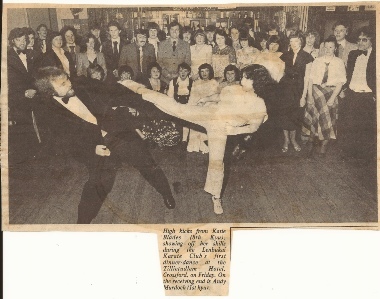 (Newspaper reads) High kicks from Katie Blades (8th Kyu), showing off her skills during the Lenbukai Karate Club’s first dinner-dance at the Tillietudlem Hotel, Crossford, on Friday. 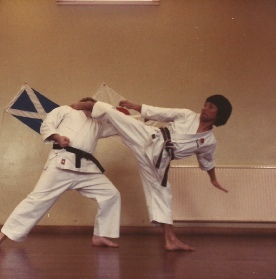 On the receiving end is Andy Murdoch (1st kyu). Sucessful Dan grading by Mr Enoeda (8th Dan) at Linwood Sports Centre. (Newspaper reads) Lenbukai Karate Club had a successful day at the grading examinations held in Linnwood Sports Centre last week. Two of the club’s members, Drew Neason and Mark Dutton, both gained their black belts on a course taken by Mr Eneoda, 8th Dan, the top karate instructor in Europe. This was their first attempt at the black belt and both passed with flying colours. Drew and Mark now bring a total of black belts in the club to six with four members all gaining their belts within the last 12 months. Senior Lenbukai instructor Andy Murdoch said: “The past 12 months have been a great boost for the club. We now have six black belts who help out at our clubs throughout the area. The club will have four gradings this year under the watchful eye of Mr Kawasoe, 6th Dan, and also course with Mr K. Taylor, 3rd Dan. 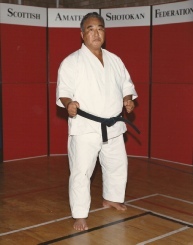 They will also hold courses with Terry O’Neill 5th Dan who will teach the new styles in Free Fighting. A training weekend has also been planned for the beach at the Heads of Ayr within the next few months. 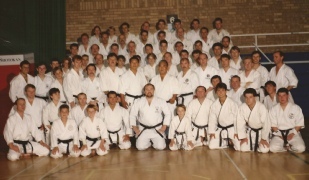 In our picture are Lenbukai’s six black belts – Back row left to right: John Haggerty(Larkhall), William Nicol(Carluke), Andy Murdoch(Wishaw) and Peter Leitch(Craigneuk). Front row – Drew Neason(Carluke) and Mark Dutton(Strathaven). These became regular courses every 3 months with a great deal of success for all students in Wishaw Sports Centre. 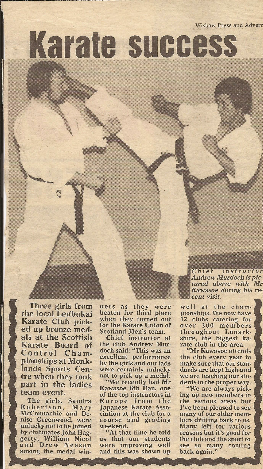 (Newspaper reads)Three girls from the local Lenbukai Karate Club picked up bronze medals at the Scottish Karate Board of Control Championships at Monklands Sports Centre when they took part in the ladies team event. 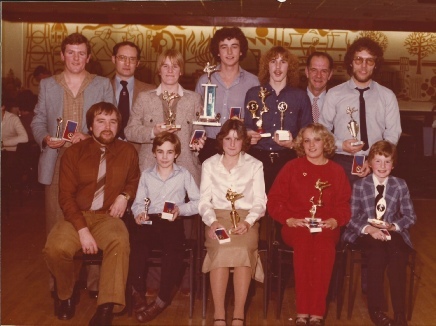 The girls, Sandra Robertson, Mary McConnachie and Denise Greenwood, were unlucky not to be joined by clubmates John Haggerty, William Nicol and Drew Neason among the Medal winners as they were beaten for third place when they turned out for the Karate Union of Scotland Men’s team. Chief Instructor at the club Andrew Murdoch said: “This was an excellent performance by the girls and our lads were certainly unlucky not to pick up a medal. 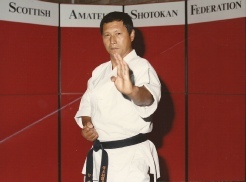 “We recently had Mr Kawasoe 6th Dan, One of the top instructors in Europe from the Japanese Karate Association at the club for a course and grading weekend. 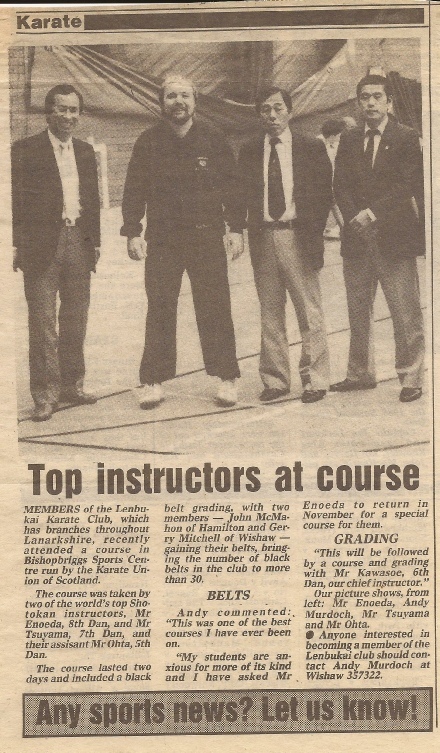 “At the time he told us that our students were improving well and this was shown up well at the championships. We now have 12 clubs catering for over 300 members throughout Lanarkshire, the biggest Karate Club in the area. “Mr Kawasoe attends the club every year to make sure that our standards are kept high and we are teaching our students in the proper way. 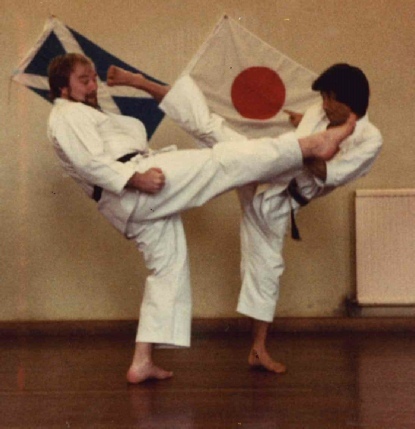 (Newspaper reads)Lenbukai Karate Club recorded a narrow 1½ points victory over Norway in a special international challenge match at Wishaw Sports Centre last week. At the end of an excellent competition the local club were very fortunate to come out on top as they were lacking in competitive fighting and training for the event. However, chief instructor Andy Murdoch was extremely please with the way the international went on the day. He said: “ The sport centre has excellent facilities for a competition of this kind and the Norwegian officals were delighted with the complex. “The staff at the centre were extremely helpful and little touches such as the flags flying inside and outside the building gave it a great atmosphere. 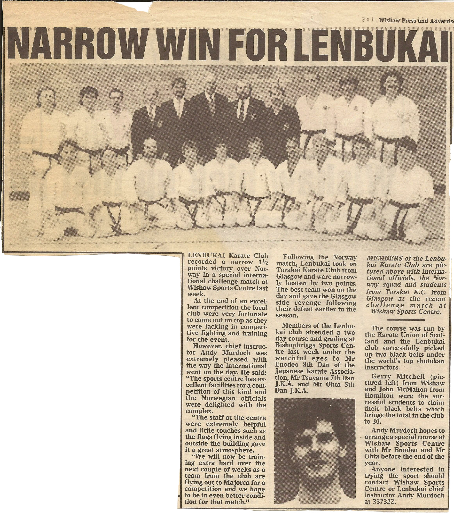 Following the Norway match, Lenbukai took on Torakai Karate Club from Glasgow and were narrowly beaten by two points. The best team won on the day and gave the Glasgow side revenge following their defeat earlier in the season. Members of the Lenbukai club attended a two day course and grading at Bishopbriggs Sports Centre last week under the watchful eyes of Mr Enodeo 8th Dan of Japanese Karate Association, Mr Tsuyama 7th Dan J.K.A and Mr Ohta 5th Dan J.K.A. MEMBERS of the Lenbukai Karate Club are pictured above with international officials, the Norway squad and students from Torakai K.C from Glasgow at the recent challenge match at Wishaw Sports Centre. 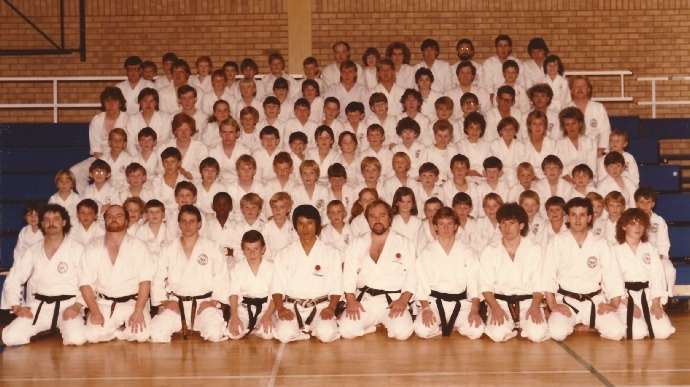 The course was run by the Karate Union of Scotland and the Lenbukai club successfully picked up two black belts under the World’s top Shotokan instructors. 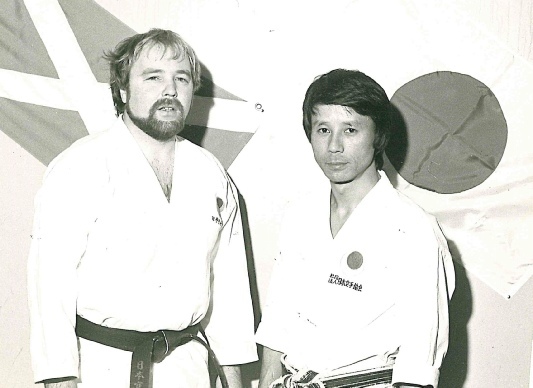 Gerry Mitchell (pictured left) from Wishaw and John McMahon from Hamilton were the successful students to claim their black belts which brings the total in the club to 30. Andy Murdoch hopes to arrange a special course at Wishaw Sports Centre with Mr Enodeo and Mr Ohta before the end of the year. 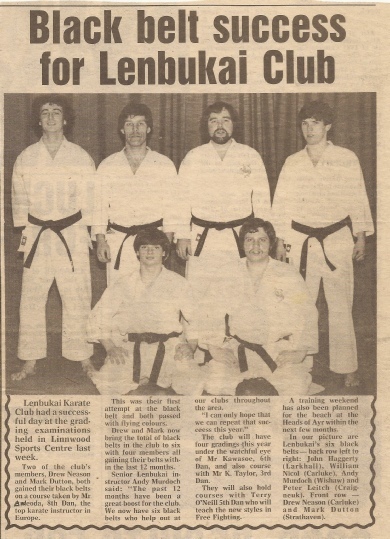 (Newspaper reads)Members of the Lenbukai Karate Club, which has branches throughout Lanarkshire, recently attended a course in Bishopbriggs Sports Centre run by the Karate Union of Scotland. The course was taken by two of the world’s top Shotokan Instructors, Mr Enoeda, 8th Dan and Mr Tsuyama, 7th Dan, and their assistant Mr Ohta,5th Dan. 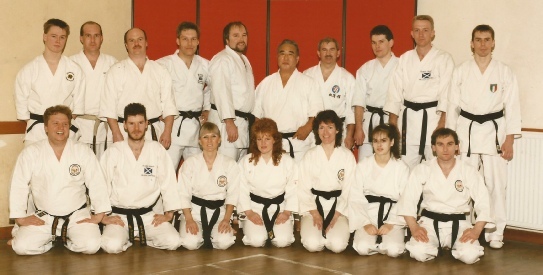 The Course lasted two days, and included a black belt grading, with two members – John McMahon of Hamilton and Gerry Mitchell of Wishaw – Gaining their belts, bringing the number of black belts in the club to more than 30. Andy commented: “This was one of the best courses I have ever been on. “My students are anxious for more of its kind and I have asked Mr Enoeda to return in November for a special course for them. Our picture shows, from left: Mr Enoeda, Andy Murdoch, Mr Tsuyama and Mr Ohta.